This month's "FluteTalk" magazine featured flutist April Clayton. At a very young age she is already a flute professor and has a great soloist's career ahead of her. 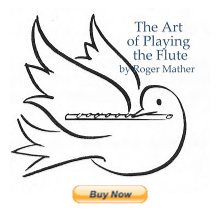 The article in Flutetalk was a very interesting read, and what a player! You can listen to her CD samples here. I love the delicacy and the refinement of her playing. And the pieces are well selected too (Dutilleux being one of my all time favourites!) Very lovely to listen to, especially the note endings!